A new year means a new start, and what better way to make a new start then with a brekky from one of Brisbane’s best new cafes? From suburban newbies to inner-city haunts we can’t get enough of, we’ve eaten our way through Brisbane’s best new breakfasts to bring you your essential brekky guide for the year. These are some of the best Brisbane breakfasts to chow down on in 2015. A brand new Brisbane café, Smoked Paprika has a Hungarian bent and an all-day breakfast menu, with is ideal when you have the hungries. Healthy and wholesome choices like the organic black quinoa porridge sit alongside more decadent breakfast fare, like the whipped Persian fetta on sourdough. Smoked Paprika is a charming and tasty new addition to the Brisbane breakfast scene. Brunch at Spring Hill’s new café slash bar, Hops Scotch and Beans, is a real treat and you can’t make a bad choice when ordering from their menu, but we can’t go past the breakfast roll. This tasty little tower of temptation is made with two poached eggs, bacon, hollandaise, and watercress on a brioche bun, and is a firm contender for Brisbane’s best breakfast burger. The reign of the poached egg is over—this year we’re all about the coddled variety, and Brisbane’s best breakfast joints are happily obliging. Graceville’s Goodness Gracious Café is serving a mean plate of 62-degree eggs, smoked salmon, sprouted quinoa, goats cheese, shaved asparagus, and mustard salad. Another bagel joint, new Cannon Hill café Keyhole Espresso has a simple and fresh bagel menu that has us hooked. While options abound here, we’re all about their Classic bagel—made straight up with cream cheese. If you’re on the hunt for a new Brisbane breakfast haunt to make your local, you need to check our Rosalie newbie, The Bounty. The smoked trout, asparagus and coddled egg is a simple and elegant addition to Brisbane’s breakfast scene, and one of our new faves. A great breakfast in the Brisbane CBD is sadly hard to come by, so we’re loving new café and bar, Cawfee. At Cawfee you’ll find a breakfast menu stacked with that permanent breakfast fave, the bagel. 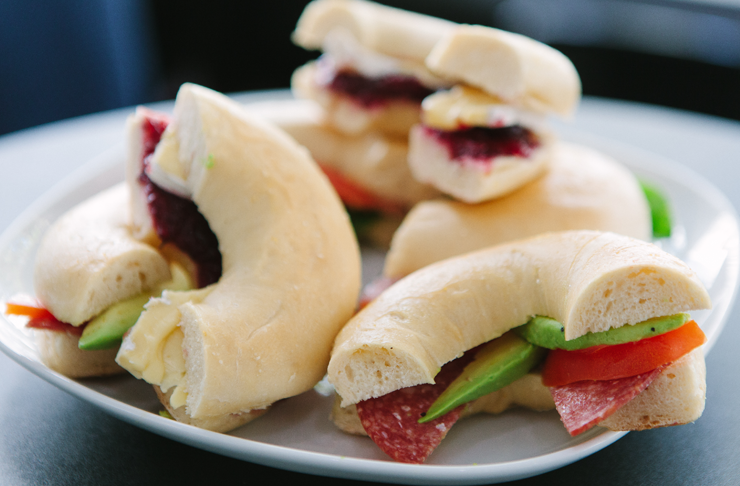 New York style bagels sit alongside sweet bagels and plenty of toast to choose from, as well as Cawfee’s epic savoury breakfast bagel: a perfect mix of avocado, Swiss cheese and bacon, on a perfectly toasted bagel. Or, if you want to go all out, try their Manhattan Breakfast, which combines a NY style bagel, with coffee and Byron Bay Cookie. New Brisbane café Seven Stones is home to one of the best big breakfasts in Brisbane, complete with rib fillet steak, but we’re diehards for their avo’ on toast, served with lemon cream cheese and pistachio dukkah. If you’re looking for a great breakfast café in the northern ‘burbs, this is one to try. If you’re not onto the good thing that is Brisbane café, Artie & Mai, you need to get a wriggle on—this gorgeous café, housed in a can’t-miss-it red building in Albion, is equal parts adorable and delicious. The breakfast menu is creative and surprising, while still including the brekky classics you crave in the AM. Our pick? The beetroot and apple rosti with smoked salmon, horseradish, and caper berries. What else would you expect from the swankiest new restaurant, bar, and hotel in town than a new contender for Brisbane’s best breakfast? Lennons’ breakfast menu includes luxe editions of all the breakfast classics (the smoked salmon and crispy potato is our idea of heaven), but it’s the free-range pork jaffle, with smoked pork hock, house pickles, and Dijon mustard that keeps us coming back. This beautiful restaurant is our new fave for a breakfast meeting, or a special brunch with girlfriends. With a brand new South Bank KTB joining the ranks, there’s never been a better time to get a bit of acai goodness into you. In case you’ve been under a rock for the past year, acai bowls are where it’s at when you want to start the day without a guilt trip. Our pick is the moreish Snickers Delight Bowl, a delightful blend of acai, banana, raw cacao, almond butter, almond milk and coconut water that tastes better than any chocolate bar ever could (and will take you through to lunch time without the sugar comedown!). If you’re looking for a healthy Brisbane breakfast to nosh this year, this is it. If you thought fast food and paleo were like chalk and cheese, think again. CBD newbie Thr1ve are dishing up tasty, healthy eats in a flash. Their breakfast menu is paleo-inspired, with loads of healthy proteins, and it’s always gluten-free. The build-your-own breakfast bowls they’re dishing up are nothing short of genius (our personal preference is the grilled salmon with smashed avo’ and scrambies) —and perfect for those of us with resolutions to keep. We are big fans of the breakfasts coming out of Billy Kart, so it’s no surprise Ben O’Donoghue’s Kitchen has made it onto our list of must-eat Brisbane breakfasts in 2015. Our pick of the menu is the Mexican breakfast: chorizo, beans, two poached eggs, chipotle salsa, and tortillas. Perfecto. The Gettin’ Place is the kind of adorbs, petite café we’d love to see more of, and it’s one of our fave new picks for breakfast in Brisbane. A simple, takeaway menu—ideal for an on-the-go pit stop on the way to work—includes a Nutella toast with banana we’ve gone, well, bananas for. The Dugout is a hole-in-the wall espresso bar and café plating up one of the best takeaway Brisbane breakfasts we’ve had this year. Their brekky menu is of the simple, order-and-run variety, but the fare it top notch, and the deluxe crostini, with goats cheese, smashed avo’, and chilli flakes might just be some of the best smashed avo’ going. This Cape Cod-esque Indooroopilly eatery has decadent brekky and brunch menus that you need to try this year. Our pick of the lot is the roasted Swiss browns on sourdough, with scrambled eggs, spinach, and goats fetta. Nantucket, we love you.